25161 Sandpiper Greens Ct #201, Bonita Springs, FL.| MLS# 218083553 | Southwest Florida Residential Real Estate for Sale. WOW!THIS PARTICULAR LOCATION IN THIS BUILDING IS ABSOLUTELY A GREAT FIND!CORNER END UNIT WITH OVERSIZED SCREENED IN LANAI OVERLOOKING THE GOLF COURSE.3 FULL BEDROOMS AND 2 FULL BATHS.RENOVATED KITCHEN AND LOTS OF USEFUL UPGRADES ADD TO THE REASON YOU SHOULD VIEW THIS UNIT AND WRITE AN OFFER. SANDPIPER GREEN'S MID-RISE BUILDING OFFERS MAINTENANCE FREE, LOW DENSITY LIVING AT IT'S BEST. THE BUILDING HAS AN ELEVATOR FOR CONVENIENCE FOR THOSE THAT DO NOT DO STAIRS. 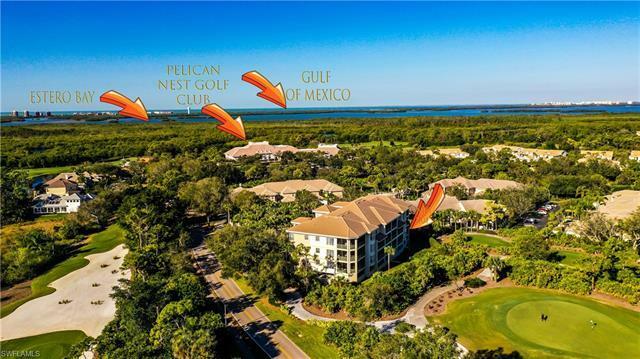 PROXIMITY TO THE PELICAN'S NEST GOLF CLUB IN JUST A SHORT 2 MINUTE WALK MAKES FOR A TRULY CONVENIENT LOCATION FOR YOUR GOLF AND DINING PLEASURE. ACTIVE LIFESTYLES FOR WHATEVER YOUR HEART DESIRES!36 HOLE CHAMPIONSHIP GOLF COURSE DESIGNED BY RENOWNED GOLF ARCHITECT, TOM FAZIO! A TENNIS CENTER THAT INCLUDES A USPTA CERTIFIED PRO AS THE DIRECTOR OF TENNIS ON SITE WITH 12 STATE OF THE ART COURTS AVAILABLE 7 DAYS A WEEK, FISHING OR SUNNING AT PELICAN LANDINGS SECLUDED PRIVATE GULF BEACH, A STATE OF THE ART FITNESS FACILITY WITH TRAINERS AND ORGANIZED CLASSES, BOCCE BALL COURTS, KAYAK AND CANOE PARK, PLUS SO MUCH MORE! THIS UNIT HAS TWO COVERED PARKING SPOTS AND STORAGE UNIT UNDERNEATH THE BUILDING AS WELL.EASY TO SHOW. BOOK TODAY!